Then when one of the windows are vaulted by the killer, the other window is open to vault. 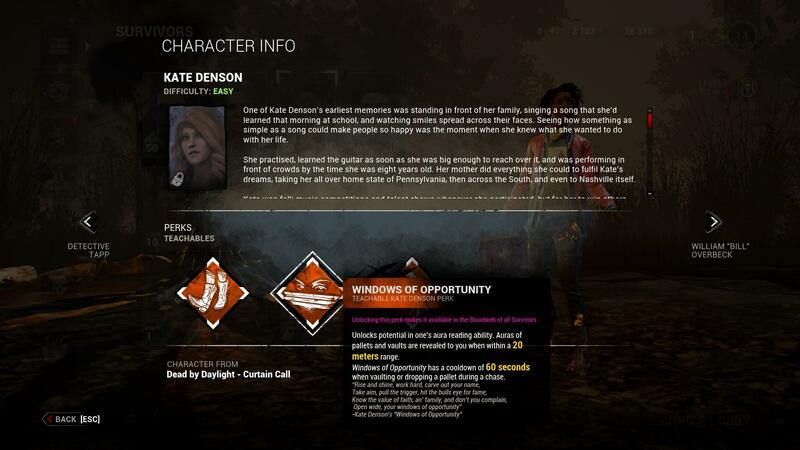 This perk is quite effective since it will slow down the healing process of survivors in the area, this forces survivors to try and escape the killer terror radius so they are able to heal at normal speed rather than the reduced speed. 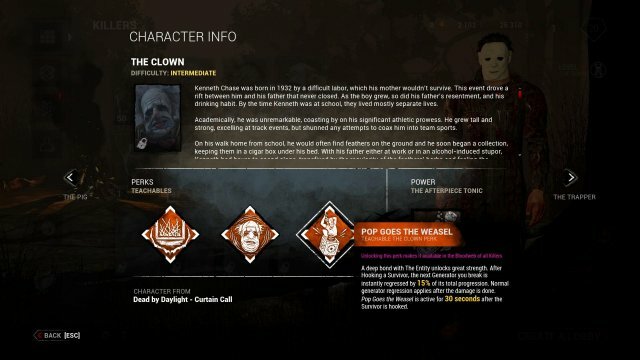 In Tier 3, this perk has a 50% penalty meaning that self-care becomes 25% of the normal healing speed making it more difficult for survivors to heal. This perk can be a real pain especially when the generator progress is nearly complete, i have had a couple killers with this perk and the last generator was at 90% but then the other survivor was hooked, the killer kicked the generator down to 65%. (Tier 3 perk regresses the generator by 25%). This ability is fairly strong when used properly. it can be used to either just throw in direct line of sight of a survivor, or can be thrown at choke points which can throw the survivor their plan to vault or pallet loop. 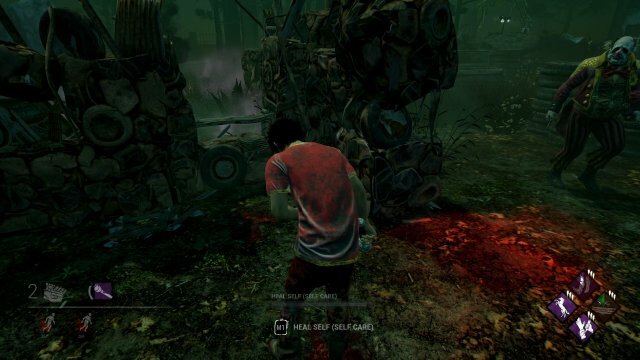 The abilty is able to slow movement of survivors and impair the survivor vision also making them cough. The killer gets 4 bottles to throw which can be recharged over 5 seconds after throwing them all (or if you have some left, it doesnt matter) Also be aware this is just be default, addons can affect how long the effect of the bottles last for. The killer is quite large in weight terms but seems the average height of the other killers, his weapon just seems like a normal blade which he swings sideways with to attack. lunge, speed and terror radius are not changed. 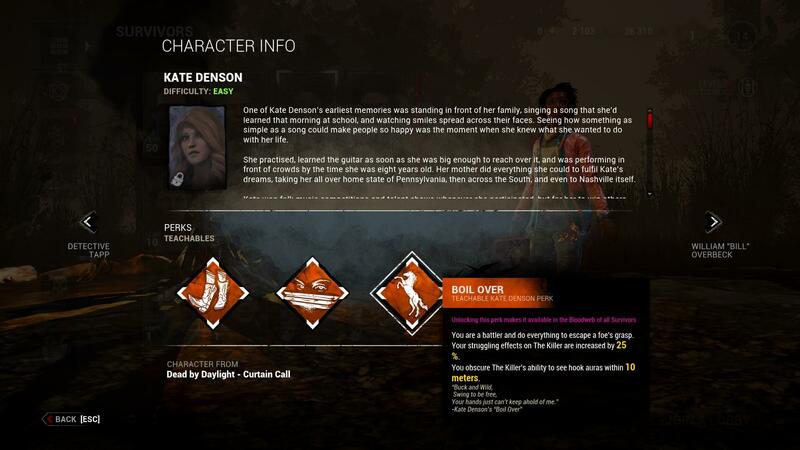 So alongside this killer we have a survivor -- Kate Denson. in general appearance, she is quite easy to see from far away, unless she is wearing prestige which in this scenario she becomes quite hidden at medium to long range. 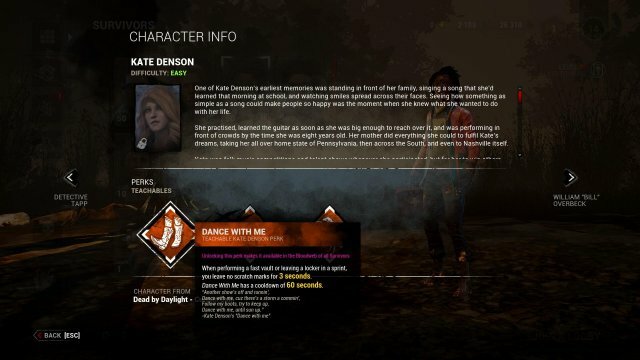 Dance with me is quite a good perk to run, if you want to make a quick escape from the killer you could vault out of a locker and sprint away for 3 seconds before the killer knows which way you went. This is more effective over a vault point so the killer loses direction by the time they have vaulted over the window themselves. Windows of Oppertunities is a little bit of a 'more experienced' player perk so they know where to vault / loop immediatly after finishing at another vault / loop area. if a less experienced player was to use this perk to find and use every pallet in the game, it would be less efficient and lower the survival chance of other survivors who need them. Do not be confused of what this perk is stating -- This perk says 'The struggling effects on the killer' meaning how much the killer will move around each time you wiggle against them, this perk can push the killer sideways from a doorway leading to the basement allowing you more time to wiggle off, this perk can also be countered with the commonly used Iron grasp perk which makes it take longer for a survivor to escape from a grasp and also reduce wiggle effects of survivors. The first counter i instantly picked up on was simply vaulting when you hear the clown charge his bottle. if you are lucky, the killer will miss and you will be unaffected by the effects of the bottle allowing you to put more distance between you and the killer and possibly escaping from them. As you can see i put this to the test, the killer was only able to hit one of the bottles directly from how much i was moving, even if this hit me, the effect was only 1.5 seconds, and i wasnt injured from the hit meaning i was able to put some distance between myself and the killer anyway. 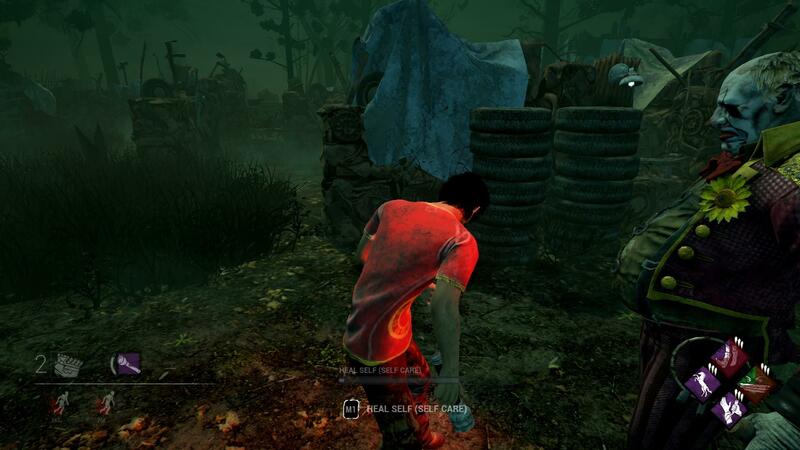 When pallet looping, if the killer throws his bottle at the pallet to choke you, either run through the gas and throw the pallet down, escaping the gas as soon as possible to gain distance between you and the killer while he breaks the pallet, or save the pallet and try and get to another location to survive. try and get the killer to use all of his bottles so he has to recharge, giving you 5 seconds of distance between you and the killer, which is actually quite a lot. 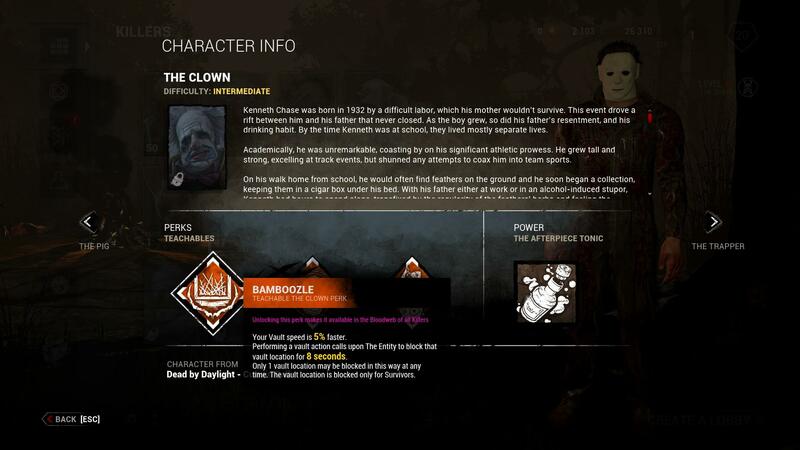 Bamboozle isnt a difficult perk to counter, if you are at a double window loop, the killer can only block one at a time. meaning you are able to vault through the other window while the killer blocks off the previously vaulted location. If there is a single vault location, just vault, bait the killer into vaulting it, and run to put some distance between yourself, else, just revault the window while the killer walks around. to hit from the other side. The best thing to do is to try and escape the killer terror radius before healing, personally i do this anyway unless i am mid chase on the opposite side of a pallet since there is a chance the killer will have A Nurse's Calling which allows them to see where the survivor is if they are healing in a certain range. Prevent survivors from being hooked, use flashlights and pallets to your advantage to save as survivor. Try and attract the killer to you for 30 seconds so they arent able to regress the generator by 25%, even if they choose to kick the generator, they lose their chance to get a survivor. 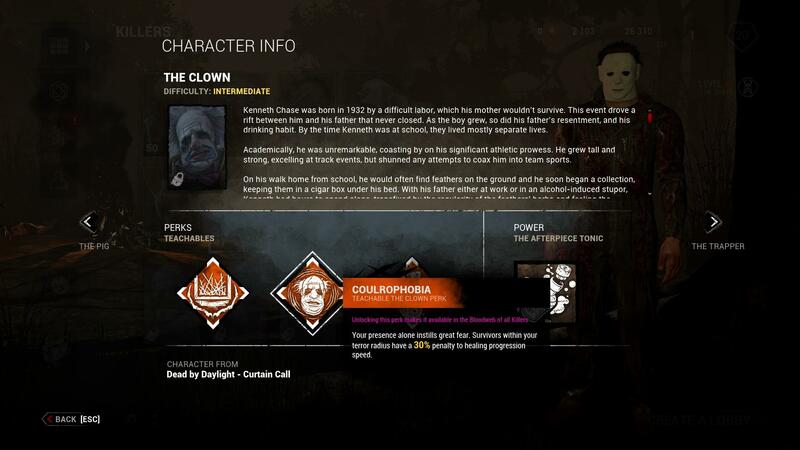 Remember that Coulrophobia is weak on Myers and Freddy since their terror radius is smaller than default, it is most effective on a huntress who has a massive terror radius. 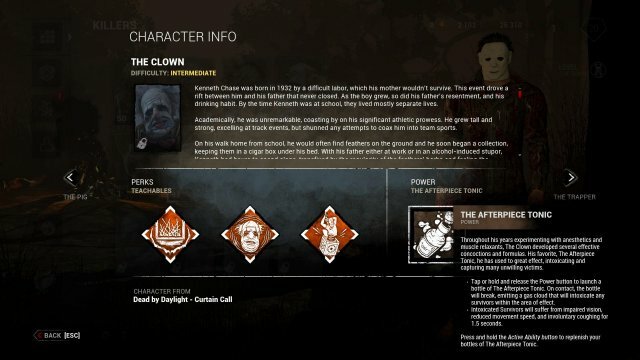 So i'll be going through some new builds with the new perks. Well if you didnt notice already, this can make a quick escape from a killer mainly in a jungle gym since there are enough vault options, if you choose to continue running after lithe and dance with me have run out, then lightweight will come in handy. D-Strike is known to be toxic so dont make a comment about something i am aware of. it is a useful perk with the loadout stated. Boil over is a useful perk for either before and after your decisive strike has been used since it will push the killer side to side more than usual. adrenaline can be used for when you escape a killer grasp and the final generator is completed to be healed back to full health, otherwise, when you escape the grasp, you have self care to use. I say this one is toxic since pallets are shown every 20 second after a pallet or vault point is used. 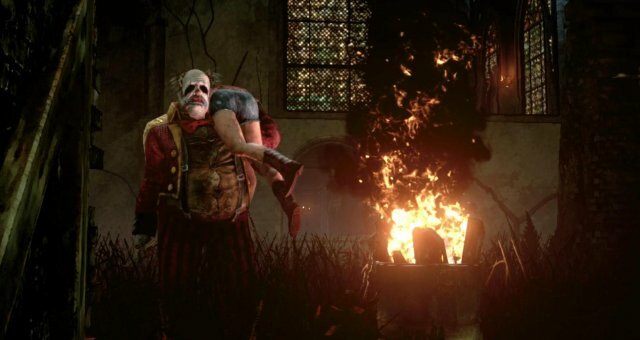 sprint burst can be saved for putting more distance between the killer and yourself or running towards a vault or pallet area. Vigil is to recharge faster for sprint burst, and Lightweight rids of your scratch marks faster when you try and make a swift escape.